After declaring areas captured in Syria and Iraq a caliphate, Jihadist group issues passport, threatening those who harm its holders. The Islamic State of Iraq and the Levant (ISIS) declared itself an Islamic "caliphate" last Sunday, and now apparently has begun issuing "passports" to further establish its Jihadist state. ISIS members this week circulated photographs of the supposed passport, which reads "State of the Islamic Caliphate" at the top and at the bottom states "the holder of the passport if harmed we will deploy armies for his services," reports Al Arabiya. 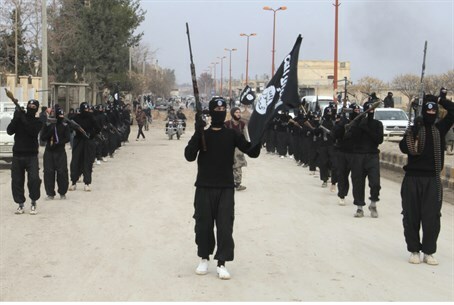 Regardless of the likelihood that the passport will be accepted by foreign states after ISIS conquered vast portions of Iraq and Syria, ISIS has said it will distribute the document to 11,000 citizens living in cities near the border of the two countries. ISIS fighters already control a large corridor along the Euphrates River in Syria stretching from the Iraq border, along with Raqa in the north, as well as parts of neighboring Aleppo province. In Iraq, ISIS has captured sizeable territories in the north and west of the conflict-torn country in a lightning offensive last month. With the reports of the passport, ISIS stated its goal is to have a caliphate spreading from Aleppo in Syria's north to Diyala in eastern Iraq. The passport is reportedly being printed in a government facility in Iraq's Mosul, the second largest city in the country which ISIS captured at the start of its blitz offensive. The facility was scheduled by the Iraqi government to start issuing new ID cards next week before being taken over by ISIS, according to reports. An ISIS spokesman on Monday revealed that his organization intends first to deal with "Muslims who have become infidels," and then attack Israel. ISIS last Friday captured a Syrian oil field in the Deir el-Zour province in the east of the country near Iraq, after seizing Syria's largest oil field last Thursday in the same region. It has already amassed great assets in Iraq, seizing Iraq's largest oil refinery, a chemical weapons facility, and becoming the "world's richest terrorist organization" by looting 500 billion Iraqi dinars ($425 million) from banks in Mosul.